FLEXIBLE SOLAR PANELS — Sun Power RV - Go Power solar panels, inverter kits, battery sales and installation for RV, motorhome, and yacht. 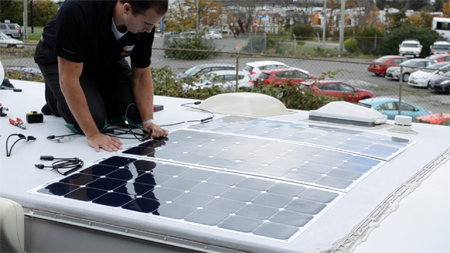 Sun Power RV offers a solar powered alternative to paying for electricity at your dock or boat slip. San Diego has many moorings and anchorages where power is not available. Adding a solar system will give you the freedom to stay put without having to run your motor to charge your batteries. With ample roof space and the proper layout, two (2) more 100 watt panels (GP-FLEX-100E), for a total of three panels (300 watts), can be connected to the same PWM charge controller that is included with the GP-FLEX-100 kit. Double solar flex on a sailboat. Solar panels for sailboats, boats, yachts, and marine appliations. Solar Flex on a RV. Two solar flex panels installed on a class B motorhome. Solar Flex panels conform to curved surfaces. The rugged durability of our solar panels guarantee you'll generate solar power everywhere you go. Go Power! Solar Flex modules are aerodynamic and DURABLE - a virtually unbreakable solar battery charger for RVs, sailboats, yachts and long-haul trucks. These kits use high-efficiency, marine grade solar modules. All Solar Flex kits come with mounting hardware, quick-connect MC4 cables and a PWM digital Solar Controller. All Solar Flex kits come with mounting hardware, quick-connect MC4 cables and a PWM digital charge controller. Penetrating or adhesive mounting options.